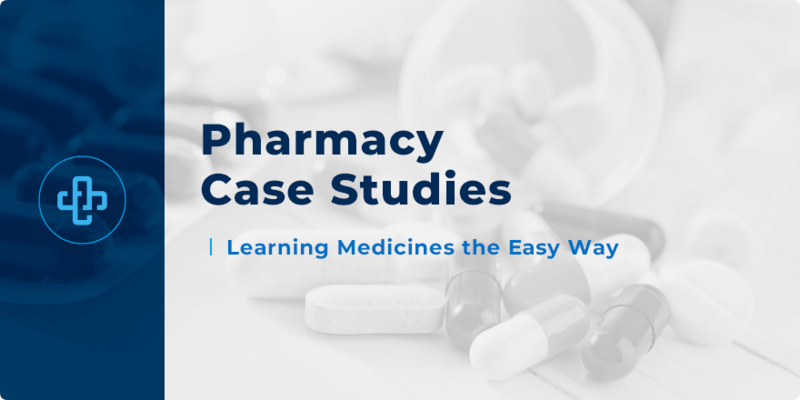 What are pharmacy case studies and why are they important? These four strands are interwoven throughout your professional career. Case studies give the pharmacy student the opportunity to test their understanding of a given topic – from the formulation and dosing of a medicine, to the drug’s mechanism of action, drug interactions and clinical suitability. Case studies are, then, the barometer through which we measure the professional competency of the pharmacy student. That is why pharmacy case studies are popular in degree programs. They compel the student to think more about a given topic – whether it be blood diagnostics, epidemiology, treatment options or drug monitoring – tying together their knowledge of medicines and how they can apply this knowledge in the real-life, clinical setting. Below, we’ve put together a sample, introductory case study to provide you with a clear example of what types of question are asked and how best you should approach each question. With enough practice, clinical case studies become that much easier. In fact, you learn to enjoy the case studies – as they are often your first direct experience of learning real and relevant facts that positively impact your long-term professional career. If you’ve found the below case study useful, we’ve compiled a list of over 50+ pharmacy case studies for students of pharmacy. Our case studies cover just about everything you need to know – from the fundamentals right through to the diagnostic clinical detail you, as an aspiring professional, need to know. First, let’s review our introductory case study to osteoporosis – fleshing out what case studies are and how they can enhance your understanding of medicines, disease and clinical therapeutics. A 49-year old woman with osteoporosis has been taking Fosamax for 6-months. She visits her GP complaining of acid reflux and pain radiating down her esophagus. What is the active ingredient of Fosamax? What is the mechanism of action of this medicine? Suggest a reason why this patient is taking Fosamax. How should the GP respond to the patient’s symptoms? What foods and/or medicines should the patient avoid? The questions probe into the medicine – how it works, what it’s indicated for, how the GP should respond to patient symptoms and what interactions, from both food and drug sources, the prescriber and pharmacist need to consider. A – The active ingredient of Fosamax is alendronate; a bisphosphonate drug. B – Alendronate works by inhibiting osteoclast-mediated bone resorption (the process whereby bone is broken down and minerals are released into the blood). C – As a 49-year old woman, the patient is likely post-menopausal. Bisphosphonates are routinely prescribed to prevent osteoporosis in this population. D – The patient may be improperly administering the medicine. Patients who do not follow the correct protocol of administering bisphosphonates are likely to experience the symptoms she reports. Patients should take the medicine in the morning on an empty stomach, while upright, with a generous glass of water. This eases the bisphosphonate through the digestive tract without irritating the esophageal wall. E – Two groups of medicines should be avoided. First, NSAIDs should be avoided; as they increase the risk of gastrointestinal side effects. Second, patients should avoid foods or supplements that contain magnesium, aluminum or calcium. This category includes dairy products and antacids. The medicines/foods should be avoided for at least the first hour after the bisphosphonate has been taken. To become a qualified pharmacist is more than passing an exam. You must have the confidence of your own ability; the ability to think outside the box as well as inside the box – knowing the essential clinical facts whilst also being skilled at developing innovative solutions to complex therapeutic problems. We understand that case studies aren’t always easy. If they were easy, everybody would become a professional overnight. That is why we’ve developed a comprehensive range of pharmacy case studies to boost your understanding of professional practice. Our case studies cover every major system as well as diagnostics, drug monitoring, side effects and drug interactions and much more – a thorough, well-rounded resource that magnifies the topics you need to know. Clinical case studies are what help you make the transition between an experienced student of pharmacy and a professional whose expertise can be trusted. In other words, case studies bring you to the very next level.